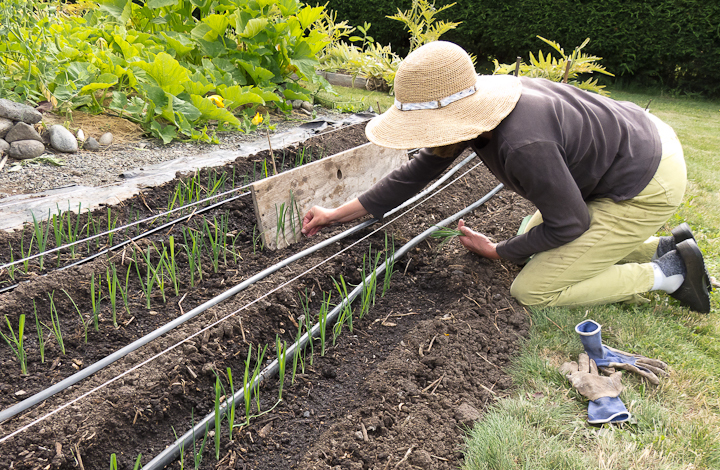 Leek roots don’t extend so deeply into the soil as, say, a single parsnip root, but leeks do have lots of tenacious little roots so harvest requires a digging fork to loosen these hardy winter alliums. And it’s a muddy task, not quite so dirty as parsnip digging but still dirty. By this stage of winter leeks aren’t things of beauty either, no longer the vigorous, tall spears of late summer but instead a bit bent with outer leaves flopped over, even slimy. Still, beneath this exterior they are perfectly fine, ready to harvest, trim and take to the kitchen. Their delicate, sweet fragrance wafts up as soon as they leave the ground and intensifies as trimming creates creamy white shafts topped with fans of green. Leeks have a subtle flavor, more delicate than onions or shallots. That’s why I like them. Onions offer strong sweetness, either sautéed until translucent or cooked down longer to a caramelized onion candy. Raw, finely diced shallots give a hint of onion to vinaigrette; cooked shallots add a complex onion flavor to sauces. And it’s certainly easier to grab a storage onion or shallot already harvested and tidily stored than it is to dig and clean a leek, but if it’s the perfume of leeks that you want then nothing else will do. Leek and potato soup is classic as is the combination of leek, kale and potato for Dutch Boerenkool. Leeks and winter squash in a tart, leeks and greens in a pasta sauce or leeks and flageolet beans in a casserole topped with breadcrumbs are all perfect combinations. 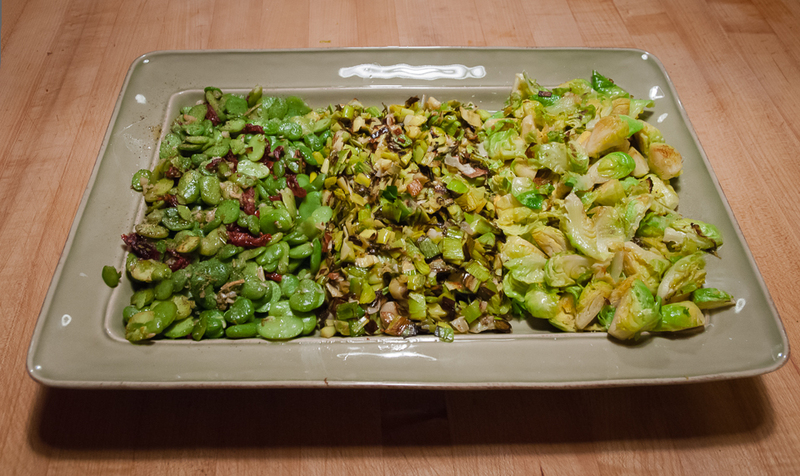 And Gruyere in the tart, Parmesan on the pasta, goat cheese with the beans each adds richness to the flavor of leeks. “Pan-Roasted Pork Loin with Leeks” from Marcella’s Italian Kitchen (1986) makes a hearty winter meal and a leek and goat cheese frittata is simple and delicious. 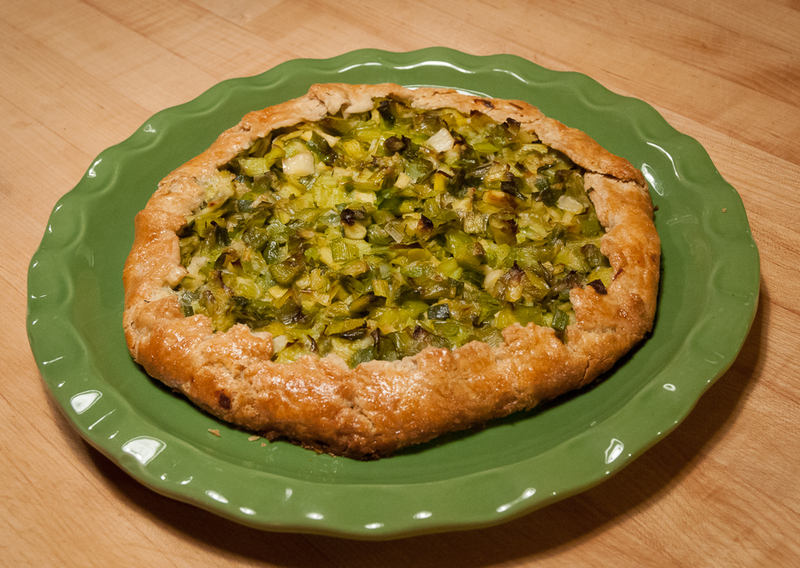 One of my favorite ways to prepare leeks is sautéed in butter and a little thyme then baked in a simple pastry crust. The first time I served this galette from Alice Water’s Chez Panisse Vegetables was as a side dish to accompany rack of lamb. It was a hit and ever since then, it’s been the main dish surrounded by other sides. Another delicious way to prepare leeks is to slice them lengthwise, brush them lightly with olive oil and roast them at about 400 degrees until soft, usually 15-20 minutes. Piping hot, at room temperature or marinated in lemon vinaigrette, it’s hard to decide which is best. They are all so good. 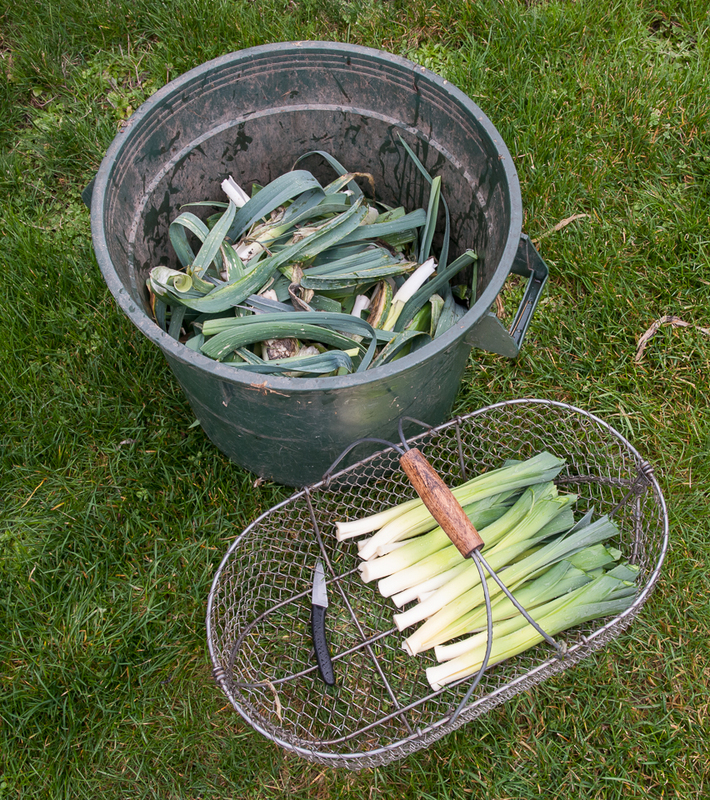 A few weeks ago, Melissa Clark in her New York Times Good Appetite column offered one more variation on roasting leeks: http://www.nytimes.com/2013/01/23/dining/roasting-renders-leeks-tender-and-versatile.html?ref=melissaclark. She halves leeks lengthwise, cuts them into quarter-inch slices, tosses them in olive oil, spreads them on a single layer on a sheet pan and roasts them at 425 for about twenty minutes, turning them frequently so they don’t burn. When they’re done, golden brown and lightly crisp, they have all sorts of uses. Clark uses them in a hearty salad of farro, chickpeas and currants but adds that she’s also used them “as a topping for fish, fowl and other vegetables, and as a garnish for soups and braised meats.” A few nights ago, I surrounded a pile of them with fava beans and roasted Brussels sprouts for a late winter vegetable platter. Leeks and fava beans are an amazing combination, delicate, sweet leeks and earthy, dense favas. I could eat them every night. 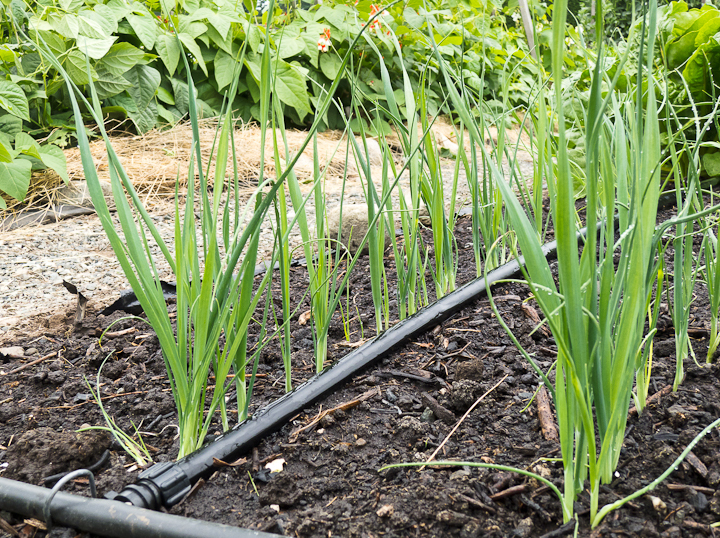 Despite all these delicious possibilities for leeks, and the pleasure I get from the process of growing them (https://lopezislandkitchengardens.wordpress.com/tag/leeks/), I confess that I was tempted to banish them from my kitchen garden this coming year. For the past two years, leek rust has found its way to my leek patch, depositing its orange pustules on the green leaves and driving me nearly to despair. The first year, I cut off all of diseased leaves as they appeared and sprayed a mixture of sulphur powder, a drop of dish soap and water on the remaining leaves. Last year I replaced this spray with a mixture of neem oil and camomile tea (http://www.hydroponics-at-home.com/rust-fungus.html) and this potion worked better to slow down and even halt the progress of the rust. As was the case the year before, the leeks kept growing, but they weren’t pretty. Maybe if I didn’t plant leeks for a year or two I’d break the rust cycle and also protect my soil, but two things have kept me from taking this step for the year ahead. One was a Google search that turned up a series of websites that treated leek rust as a manageable evil. Two sites I especially like are the British Garden Organic – The National Charity for Organic Growing (http://www.gardenorganic.org.uk/factsheets/dc8.php) and the blog by Osborne’s Seeds in Mt. 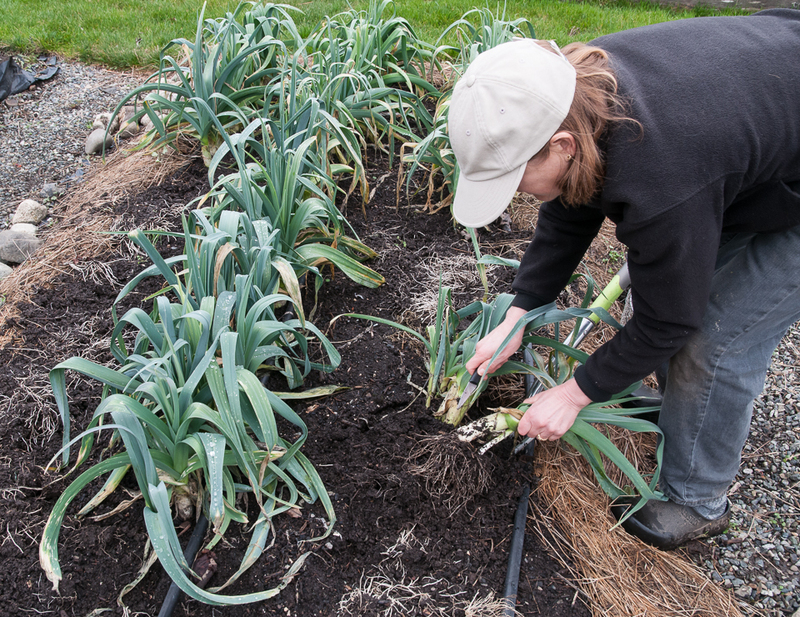 Vernon, WA (http://vegtrials.blogspot.com/2011/11/rust-fungi-and-disease-resistant-leeks.html). I’m planning to follow the “prevention and control” advice from the British site. The other encouragement to plant again this year was the mention of a seed variety that showed leek rust resistance: Bandit. I ordered a packet from Johnny’s (http://www.johnnyseeds.com/c-33-leeks.aspx). If neither the growing advice nor the seed variety works, I will let leeks go for a few years, but the lovely flavor of leeks is spurring me on to do battle with rust for one more year. Stay tuned!